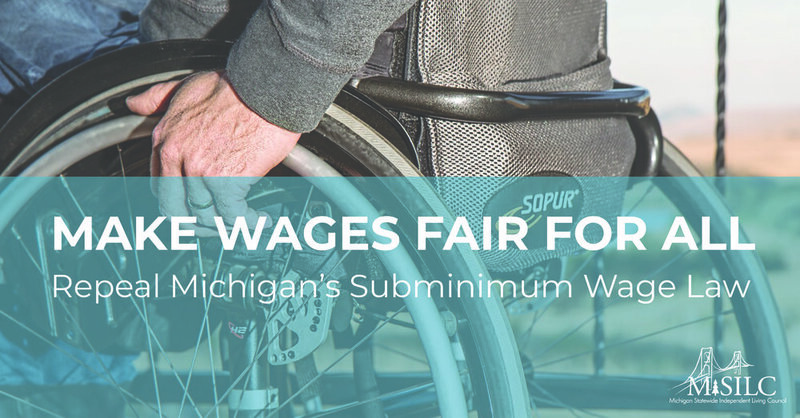 On Wednesday, February 14th HB-5587 was introduced in the Michgian House of Representatives to eliminate the practice of paying sub-minimum wage to persons with disabilities. Please continue to follow the end sub-minimum wage web site for further updates. Advocacy efforts regarding competitive, integrated employment of individuals with disabilities has been increasing over the last year. The implementation of the Workforce Innovation and Opportunity Act is reforming and strengthening the workforce development system to facilitate the match between individuals seeking work and employers seeking workers. We recognize that people with disabilities are a valuable talent pool and contribute to the workforce and to our communities. Acknowledging these talents is long overdue. The elimination of sub-minimum wage is central to the eradication of the economic disparities that people with disabilities face. Earning a livable, fair wage is an essential part of community participation. It is time to assure all members of society have such opportunities. Elimination of sub-minimum wage will bring Michigan into the 21st century. The Statewide Independent Living Council, Developmental Disabilities Council, Michigan Protection and Advocacy along with other organizations support steps in this direction and look forward to the day when everyone’s contributions are recognized by society in meaningful ways. Twenty three percent of Michigan adults live with a disability. * Yet, until recently, the state’s legislation and planning regarding access and independent living has largely been drafted without direct input from the citizens affected by that legislation. The consumer-led Common Disability Agenda, developed by the Michigan Statewide Independent Living Council (SILC), is changing that. All persons with disabilities should have equal access to public places and services. This may seem like common sense, but the concept gets trickier when you consider that, like many other states, Michigan’s budget doesn’t allow for unlimited spending. So what gets funded, and where do our priorities lie? The answer to that can only be provided by the people who use the state’s services and programs on a daily basis—or at least would, if they were widely available. It is crucial to not only invite, but actively seek, public input on these priorities. As director of the Statewide Independent Living Council, it has been my mission to listen to suggestions from the people most affected by our work. This spring, SILC has begun implementation of its Statewide Plan for Independent Living. As we do so, we have traveled all over the state and held public forums requesting input from individuals with disabilities, family members, service providers, and advocates. We’ve heard from consumers in Traverse City, Saginaw, Muskegon and Marquette. Over the course of the next six to eight months, SILC members will travel to 21 communities from Detroit to the Upper Peninsula. After only a few of these hearings, we’re already drawing key connections between the services available and the need in the communities. Michiganders with disabilities deserve reliable and affordable access to healthcare, transportation, job opportunities, and other services. Yet all too often, the disconnect between what is needed and what is available widens if we fail to listen to the priorities of those who know them best. Persons with disabilities in Michigan face even greater challenges in the less-populated areas of the state than they do in the city centers. Access to transportation is often more limited, and many businesses lack the financial resources to update to ADA-compliant structures. Our Council member, Aaron Andres, knows this all too well: when he moved to Marquette in 2012, he found limited accessibility a significant hurdle in his job search. By volunteering for an area Independent Living board, he was able to influence policy statewide and improve access for people with restricted mobility. Access to health care, too, presents a problem. When Aaron moved from Indiana, switching Medicaid policies was a byzantine nightmare of paperwork, and no one seemed to have the answers he needed. It took determination and patience, but he learned from the experience, and brought that lesson to his work with SILC. Aaron is not alone in this: of the respondents to the 2013 Michigan Behavioral Risk Factor survey who declared that they were living with disabilities, 46 percent had been in poor physical health on at least 14 days of the previous month. By contrast, only eight percent of those with no reported disability had the same problems. The same study found that 26 percent of individuals with disabilities had no health care access in the past year due to cost, as opposed to only 12 percent of the non-disabled population. We can do better. We have to do better. As Michigan’s population ages and its younger citizens move out of state, solving the independent living crisis must become a priority. We need to build the state’s capacity for independent living. It’s been obvious for some time that our state’s infrastructure is failing its most vulnerable citizens. At SILC, the council faces a hefty challenge, but we also have the opportunity to do it right, and to do right by the people who depend on the council’s planning and foresight. Our council is composed of people with disabilities, their family members, and advocates. The numbers are staggering, and our task is daunting. But already we have received invaluable suggestions from these public input sessions. I’m confident that—if we continue our outreach and listen to our consumers—we can shape policies that provide the services all Michiganders need, regardless of where they are. We don’t have all the answers yet, but at least we’re asking the right questions of the people who can provide those answers. For a complete list of our public sessions, visit www.misilc.org. Lansing, MI (March 2017) – The Michigan Statewide Independent Living Council (MiSILC) is hosting public input sessions in order to offer direction to Michigan's independent living movement. MiSILC and their partners are responsible for developing a statewide plan that outlines the goals and objectives to improve the lives of people with disabilities in Michigan. Michiganders can learn aboutMiSILC and can register for any of the sessions by visiting the website www.misilc.org. People can also find MiSILC on Facebook. The first event in the series for 2017 will be held in Saginaw on April 6. When: Thursday April 6 from Noon to 3 p.m.
Where: Saginaw ISD Transitions Center, 3860 Fashion Square Blvd, Saginaw, MI 48603. Find the Resources you need to live independently. People with disabilities deserve choices. The choice to live at home with Long Term Services and Supports should be an option. Yet, that choice can be taken away from individuals with disabilities. Forcing individuals into institutions - such as nursing homes - still happens in 2016. There is new piece of legislation introduced to the Senate. It is the S.2427, the Disability Integration Act. This act will give people with disabilities supports and options for independent living. The Michigan Statewide Independent Living Council board supports this important piece of legislation. MISILC sent letters to Senator Debbie Stabenow and Senator Gary Peters asking for co sponsorship of S.2427, the Disability Integration Act. The Disability Integration Act was introduced by Senator Schumer on December 18, 2015. The bill removes preferences within insurance coverage for supports for persons with disabilities. Instead of providing service in institutional settings, it sets a preference for community-integrated services. The DIA will allow an individual with a disability to remain a connected and positive member of their community. It also allows for services to be provided at a lower cost and with more long-term success. The Statewide Independnet Living Council would like to thank those who provided public and written comment on the current draft of the State Plan for Independnet Living (SPIL). All received comments have been complied into a single document. The Chair of the council has called a special meeting on June 20th at 10.a.m to hold a final vote on the SPIL. Changes to the draft document based upon public comment will be posted to the site.